This TV movie (from HBO, in its infancy) was a lot of more fun than I expected. The premise is simple enough - in 1948 Los Angeles magic is now routinely used by everyone. This has made policing organised crime even more difficult, and private eye Phil Lovecraft is a dinosaur, a 'shamus' who uses no magic at all. So why does a rich, eccentric Amos Hackshaw hire Lovecraft, of all people, to retrieve a very valuable book that's been stolen from him? And yes, it is the Necronomicon. This might sound like fanfic of the silliest kind, but in fact Joseph Dougherty's script is spot on in its combination of traditional hard-boiled crime fiction and supernatural horror. Fred Ward's Lovcecraft couldn't be more different from his illustrious namesake, as he punches and wisecracks his way through a satisfying plot that sees him encounter dames, gangsters, cops, zombies, demons, and quite a few other things. Ward is a convincing gumshoe with a face that looks like its been punched rather a lot, sometimes from the inside. David Warner earns his paycheck, as always, in the role of Hackshaw, whose intentions re: the fabled book are of course less than academic. Julianne Moore is sultry as Lovecraft's ex, nightclub singer Connie Stone. The film is very much of its time, with some slightly dodgy but endearing visual effects. The soundtrack is nicely jazzy, the overall look is well-realised, and there's an excellent supporting cast. The workings of a magic-driven economy are amusingly (and horrifyingly) handled, with undead construction workers shipped in from Haiti in containers. After the usual runaround Lovecraft finally has to deal with a genuine opening of the portal that will let the Old Ones return. I think Great Cthulhu himself appears, though he didn't actually introduce himself. It might have been Yog-Sothoth. The point is that there's a happy-ish ending with a predictable but still satisfying twist. The dialogue is often delightful. When Hackshaw explains that the nasties have been waiting for millennia Lovecraft asks 'How long is that in dog years?' As tributes to Lovecraft go, this is one he would probably have hated (as well as being a hard-drinking guy who likes a tumble in the hay Phil gets help from a charming voodoo priestess at one point), but it's still a good, solid bit of entertainment. 'Excellent, well-written stories that are disturbing and unnerving rather than full-on horror. Let's have a referendum on Arthur Machen! You know it makes sense. We're all a bit decadent at heart. To the right is a column of blog things, and if this is working properly there'll be a Machen poll at the top until the end of the month. So, which of Machen's tales do you rate? You can vote for more than one, if you like. Personally I'm torn between 'The Great God Pan', 'The White People', and 'The Inmost Light'. I know there are Machenites out there, lurking in the hills, so get voting! UPDATE: Hurrah! People are voting. It seems that, as of now, 'The White People' is doing well. But it's still early doors (in the Welsh hillside). Next up - M.R. James. This BBC radio drama is a treat for fan of old-school supernatural horror. Starring John Duttine and dramatised from Westall's story by Martin Reed, it's the tale of an apparently harmless project to drain the eponymous boating lake. A local antique dealer is keen to see if there are any interesting finds, as is the curator of the local museum. But what they find in the sludge at the bottom of the pond is of more than historical curiosity. What I like about this is the way it's carefully constructed and rather low-key for much of its length, but when the horror emerges it is very disturbing. Westall, most of whose works were for children, really knew how to reveal something nasty in a subtle, intelligent way. There's a sound back story featuring a mediaeval abbey, the murder of an occultist, and a model boat. Westall's work has been sadly neglected by TV and film producers, perhaps because he's out of fashion, or seen as primarily a children's author. Maybe it's London-centric snobbery, or simply that deceased authors don't get traction. Whatever the reason(s), though, it's sad that one of Britain's best ghost story writers of the 20th century has never received the screen treatment his work deserves. Anyway, three weeks left to listen to 'The Wheatstone Pond'. It occurs to me that, for someone who listens to a lot of audiobooks and dramas, I seldom review any here. So let me remedy that situation by mentioning a few of my favourite audio productions. Let's begin with Naxos Audiobooks, a firm that's long specialised in extremely good readings with classic music soundtracks. Naxos deals in the classics, by and large, and anyone who's into Dickens should seek out their recordings of the wonderful Anton Lesser. The firm offers downloads in its online shop, but its CD releases are well worth having, not least because they usually contain extensive notes on the text in an accompanying booklet. 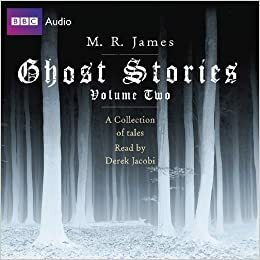 In the realms of supernatural horror Naxos offers a handful of ghost story collections, including M.R. 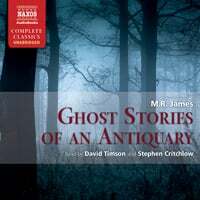 James' Ghost Stories of an Antiquary. Read by David Timson and Stephen Critchlow, this 4 CD pack offers are first-rate readings. You can listen to an audio sample here. For devotees of the Great Old Ones, most of Lovecraft's stories are available from Naxos. Again the quality of the reader, William Roberts, plus incidental music makes for a very satisfying listen. For more restrained thrills (sort of) they offer Le Fanu's In a Glass Darkly. 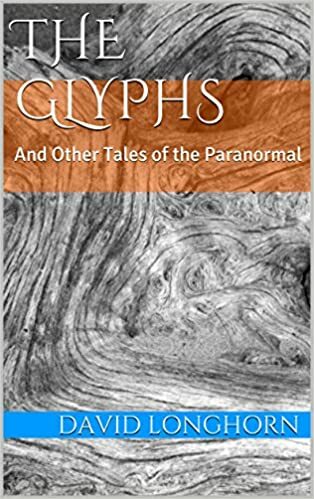 Naxos has also released several multi-author collections - these include Classic Ghost Stories, The Moonlit Road, and Great Ghost Stories. There's also a collection of new stories, The Clumsy Ghost & Other Spooky Tales, specially written for Naxos. Since I've mentioned Lovecraft, I can hardly omit the pleasures of the HPL Historical Society's audio dramas. You can see what's on offer here, at their Dark Adventure Radio Theatre page. I have had the pleasure of listening to their productions, and can testify that they are usually great fun. The weaker efforts falter simply because the original material is flawed (as in 'The Horror at Red Hook') but at its best DART offers bonkers delights, as in 'Herbert West - Reanimator! ', 'The Call of Cthulhu', 'The Cast of Charles Dexter Ward', 'The Shadow Over Innsmouth', and 'At the Mountains of Madness'. The fun is enhanced by the retro stylings that include tongue-in-cheek radio commercials (who'd have thought cigarettes would be so good for the lungs? ), and breathless announcers promising more shivers to come. Audible, an Amazon subsidiary, has made big inroads into the audio market, and it offers a wide range of spooky material, not least because it sells material by other producers, including Naxos and the BBC. Here you'll find a lot of material by modern horror writers, but also quite a few classics. I recently enjoyed 'Mrs Zant & the Ghost' by Wilkie Collins, read by Gillian Anderson. What's more, I got it for nothing, because Audible offers regular freebies to subscribers. It also does some heavy discounting - I recently purchased about twenty hours of Lovecraft for less than a tenner. I mentioned the BBC, and there are of course a lot of good things to be had from the corporation. Some are straight radio productions, others are readings specially produced for CD/download release. Derek Jacobi's excellent readings of M.R. James' stories are highly recommended (by me), as I think Jacobi's voice perfectly captures the combination of wit, intelligence, and dark insight that one associated with James. And, yes, they are on Audible. There is of course a fair amount of free material out there, and much of exists because of shaky copyright enforcement online. However, if the material is out of copyright there's no ethical dilemma in listening to, say, a Librivox recording. These latter vary widely in quality as they rely on volunteers, but some of their efforts are pretty good. You really have to take pot luck, and there's no shortage of obscure stuff for those with the time and inclination to seek it out. Well, that's a quick look at some of the audio on offer. I'll round off by mentioning BBC Radio 4 Extra, a digital channel dedicated to repeating drama, comedy, and documentaries. Its drama output often includes horror/weird fiction. Here, for instance, is a Robert Westall story dramatised, starring John Duttine. It's pretty good, and like all R4x programmes you can listen at your convenience on the BBC iPlayer. Any aspiring writers might like to know that I offer Editorial Services at reasonable rates. What's more, if your a first-time client I'm offering you free advice! Submit a short story of up to 7,000 words and I will give an honest, detailed, and (I hope) rather helpful assessment of it, absolutely free. Oh, and it doesn't have to be in the supernatural genre, I'll happily consider any kind of fiction. You know it makes sense. But just in case you're unsure, let's see what Simon says. Lovers of the traditional English ghost story need no introduction to the work of C(live) E(dward) Ward. His first two collections from Sarob Press sold out quickly and I'm sure the same will be true of this latest book. Malevolent Visitants consists of eight stories, two of which are previously unpublished. They're all, like Ward's previous collections, very much in the M.R. James tradition. His characters are usually prone to investigate historical matters best left unexplored, and pay the same sort of price as Mr Wraxall or Mr Paxton. The main difference is that Ward's interest in military history means that events of the Civil Wars or similar turbulent periods often provide the basis of a story. That said, one tale - 'The Mound' - is entirely devoid of historical framework. Instead it concerns an ordinary man who gives in to the excusable desire to investigate a road that, according to a sign, leads to the eponymous landmark. It turns out that, far from being an historical site, the Mound is something else entirely. The story stands apart from the rest as a tale of unexplained horror, and is oddly effective. More traditional is 'At Dusk', in which a tourist explores a small market town, in search of the grave of a writer. We are in M.R. James country, figuratively and literally, and the sense place is nicely evoked. Part of the fun of such a story is that we know something nasty will befall the protagonist, but can enjoy the mechanics of how he ends up in a climactic pickle. The same can be said for 'The Return', which provides the inspiration for Paul Lowe's splendid cover. Here, again, is the hapless traveller - bookish, of course - who finds himself in a town about to celebrate a Civil War anniversary with a costumed pageant. The contrast between quaint, touristy attitudes to historical events and the real violence that happened at the time is brought home to our 'hero' in no uncertain terms. There's more military history in 'Squire Thorneycroft', in which a young solicitor has to try and sort out the affairs of a recently deceased squire. A battlefield diorama of one of the British Army's worst defeats provides a hint as to the grim secret that made a former colonial general become a recluse. 'Merfield Hall' is arguably the most Jamesian tale, not surprisingly since it is Ward's completion of an unfinished story by M.R. James himself. It offers a good evocation of the kind of dream sequence the latter produced in 'Lost Hearts', and the ending is clever. I certainly didn't see it coming. Just enough is left unsaid, but much is implied, which is an authentic touch that I think the Provost would have approved. 'One Over the Twelve' also takes its lead from James, using a plot device he mentions in 'Stories I Have Tried to Write'. It has the framing narrative of a tale told on Christmas Eve, plus a mysterious family vault and a sinister secret. 'The Gift' is another excursion to East Anglia, and is a Victorian period piece in which a clergyman ignores sensible advice and probes too deeply into the history of his parish. Perhaps the besr of the lot, however, is 'The House of Wonders', one of the new tales. It concerns an author who investigates an old-time seaside attraction as part of research for a book. There's a wealth of fascinating detail about the paraphernalia of sideshows, and a satisfying plot that offers a new twist on a familiar horror story trope. The malevolent visitant in this case is memorably disturbing. All in all, this is another satisfying collection of 'old school' ghost stories for discerning readers of any school. And here's that excellent cover again. The just-a-bit-of-fun poll on the stories of Algernon Blackwood ended with a resounding victory for 'The Willows', with 'The Wendigo' lagging in second place. I think the next author should be M.R. James - but which stories to include? Or, more importantly, which ones to leave out? Here is a provisional list - what's missing? "Oh Whistle and I'll Come to You, My Lad"
Well, this is annoying. The very simple Blogger poll widget that I used before has now stopped working. I will explore alternatives. Over at the ST YouTube channel (oh yes, we have one of those as well) you can hear a number of old radio shows and readings of classic tales. Here's one, an excellent dramatisation of Walter de la Mare's classic tale, broadcast back in the Sixties on US radio. I could just have typed 'WTF Fulci?' about a hundred times, but instead I'm going to try and convey the essence of what I experienced as I watched this remarkable film. I recorded my 'thoughts' on a small digital device as I went along. I may have been slightly drunk. What follows has been edited for swearing, repetition, and repetition. Do I hear Tubular Bells in the distance? Okay, this is City of the Living Dead, a Fulci film from 1980. It begins with a piercing scream followed by the familiar white titles on a black background. Then we find ourselves in a graveyard as the credits roll. The camera moves in a wobbly way as I read a list of Italian names. The soundtrack has a distinct whiff of John Carpenter about it. 'Story and screenplay by Lucio Fulci, Dardano Sachetti'. An Italian production, but from the blurb I know it's set in America, and I'm watching the dubbed version, so fun and hijinks will probably ensue. Now we see someone walking through the graveyard - it's a priest, and he's looking a bit pale. Not at all well. This is a man who's seen too much, and possibly drunk too much. And at the bottom of the screen appears the legend 'dunwich', with a small 'd' - perhaps this was trendy in 1980? 'Yeah, capital letters are like, capitalist? Tools for fools, man!' Shut up and have the last Mars Bar. The priest is now looking up a tree limb that might well be sturdy enough to support the weight of a man. Just speculating wildly, here. 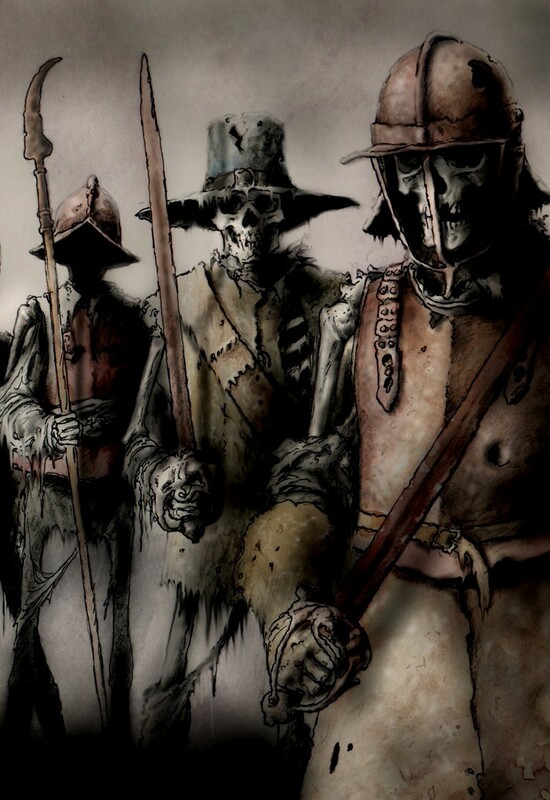 Malevolent Visitants by C.E. Ward is now available at Sarob Press, but it's going fast. I thought I'd mention it as I've just become the proud owner of a review copy. The superb Paul Lowe cover is a hint as to its contents. Malevolent indeed! With swords and that. Anyone who knows Clive Ward's fiction will know that he is 'old school', creating modern tales that are solidly in the tradition of M.R. James. If you like traditional English ghost stories try and get hold of this book, not to mention his previous Sarob volumes Vengeful Ghosts and Seven Ghosts & One Other. Horthólary: Tales from Montagascony by Michael Reynier (Tartarus Press, 2015) contains four stories set in a fictitious, but very well-realised, region of France. The time is the 18th century, a new scientific enlightenment vies with both superstition and Catholic dogma, and Summanus Horthólary, a provincial scholar, keeps getting involved with weird events. It only occurred to me after I'd finished that Sherlock Holmes was of French descent, on his mother's side. It may be that there were a few Horthólary genes in there, as the investigative methods of the two men are not dissimilar. The first story, 'The Angel of Pessane', sees Horthólary investigate an apparent murder. The body of an eccentric Englishman (is there any other kind in France?) is found in a forest near the city. The corpse lies in fresh snow, and there are no footprints around the body when it is discovered by local children. The local bishop, Philippe Rapin (the scientific sleuth's arch-enemy) immediately blames gypsies for the supposed crime. But Horthólary sees a very different story in the evidence - or lack of it. To avoid major spoilers I can only say that the story reads like a hybrid of Wells and Conan Doyle, for all its French setting. In 'Dii Nixi' Reynier takes us back to Horthólary's childhood in a tale that begins with the arrival of a celestial visitor. There's a distinct whiff of Lovecraft about the plot, if not the prose. Reynier's clear, slightly ironic style conveys superbly the vicious rivalry between the local peasant clans, and the way in which the emergence of a weird otherworldly menace affects the destinies of a barefoot Romeo and Juliet. Reynier has a gift for evoking the beauties of untamed nature, and contrasting them with the often grubby ways of our own species. 'The Nephilim', as the title suggests, concerns legendary beings said to inhabit the desolate plateau that looms over Montagascony. Here we find young Horthólary and another student despatched by their tutor to investigate mysterious fossil finds that (contrary to reason, if not scripture) support the existence of giants. What the investigators uncover is not merely startling, it also terrifying, and the price of knowledge proves very steep for one of them. The final story, 'Nemestrinus', sees Rapin - now promoted to Archbishop - engaged in a heretic hunt that sets him at odds with the aged Professor Horthólary. 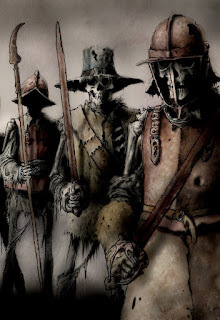 In all of these stories Reynier makes no bones about the brutality of an era that, in many a BBC costume drama, is often prettified and shown from the perspective of the well-to-do. Here we see the reality of life in a society where the poor are almost powerless and torture is a routine instrument of 'justice'. There is also a very convincing depiction of witchcraft as it might have been (as opposed to how the witch hunters imagined it). Overall, these stories succeed in evoking Reynier's imaginary province extremely well, and it's refreshing to find that Montagascony's inhabitants are as three-dimensional as its varied topography. There is a wealth of telling detail; thus we learn that Horthólary's father, a clockmaker, wears 'linen shirts several sizes too small for him, a custom adopted so that the cuffs do no interfere with his delicate work'. In addition, the author's wealth of historical, occult, and scientific knowledge supports but never overburdens each plot. These stories certainly qualify as weird fiction of a high order. Reynier's work deserves to be better known. Note: I received a free ebook from Tartarus for review purposes. I don't bother with 'news' items about ghosts, as a rule, because a. there are just too many of them and b. most of them are quite silly. But I feel that claiming you were driven out of your house by a Satanic Goat is worthy of note. As Cole Porter so very nearly wrote. The haunting spectre of a satanic goat has left a woman so terrified of her home that she's put it up for sale. Vanessa Mitchell's cottage has been dubbed "Britain's most haunted" after a series of spooky incidents prompted the terrified home owner to search for a brave buyer. The 43-year-old claims to have been shoved while heavily pregnant, smacked on the bottom and to have seen blood splattered across her floor whilst living in the house in St Osyth, Essex. I don't want to trivialise Ms Mitchell's plight, but being smacked on the bottom and seeing blood spattered about the place are not always paranormal phenomena, and that goes double for Essex. The property, also known as "The Cage", was formerly a medieval prison and is said to have hosted one of England's most infamous witch trials, in which eight women were killed. Well, that would have Mulder convinced from the get-go, while Scully would point out that anyone living in such a historically charged environment might well be haunted by bad dreams and hallucinations, and interpret even the most commonplace event in the context of a rather simplistic, Hammer film view of English folk history. Then a cup would fly across the room and shatter against the wall. But fair play, if you're going to encounter demonic forces, it would seem to be the ideal place. And, if we riff on Nigel Kneale's 'stone tape' hypothesis, perhaps the real horrors of the cage have somehow been imprinted on the very fabric of the building. If we accept that the experiences and imaginings of people can be 'replayed' (a very big If, as there's no evidence they can) it would be the ideal site to encounter our ancestors' worst fears. Including, presumably, goat demons. Put another way, maybe living in a place called The Cage isn't the wisest of moves. It might make a perfect bank or supermarket. I've put up another opinion poll to the right (or above and to the right, depending on when you read this). I wondered if people would care to choose their favourite Algernon Blackwood story from the ones listed? You can vote for more than one. To be honest, I could have just put three there - 'The Willows', 'The Wendigo', and 'Ancient Sorceries' (the one about the French town o' cats) I've sure the battle for first place will involve 'The Willows' and 'The Wendigo'. But I thought I'd give people a wider choice. I might just as well have added 'The Glamour of the Snow' or 'A Victim of Higher Space', as Algy did write rather a lot of good, readable tales. In other Blackwood news, someone on Facebook recently posted a link to an old BBC radio drama based on AB's novel The Human Chord. (The link leads to Dropbox, but I don't think you have to have that app for it to work.) It's by Sheila Hodgson, best known as the writer of a series of excellent plays featuring M.R. James encountering 'real' spooks. But see what you think of this one. And note, this off-air recording is not of great quality.